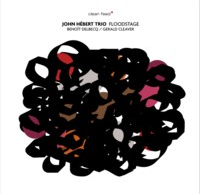 The sophomore album from the John Hebert Trio, following 2010's Spiritual Lover disc (also on Clean Feed), opens with a rich, dark, brooding atmosphere of the sort Miles Davis used to conjure up in the 1970s. The piano trio, led by prominent NYC bassist Hebert, is augmented by a weird electronic delay-soaked pulse that flies in and out of the track like a drunken firefly in search of a place to pass out. This piano trio is different. Things start swinging right away following this slightly surreal introduction with the title track, but it retains a dreamlike quality. The pulse wobbles and changes tempo and direction often enough that the alcohol-soaked quality comes to mind again; but I also can't help thinking of a dust devil in slow motion. (Isn't that it on the cover?) Drummer Gerald Cleaver is especially expressive here as he pushes and pulls the momentum of the music like a puppeteer controlling a mobile in a wind storm. This is followed by a very abstract blues called “Red House in NOLA,” appropriately steeped in humidity. Hebert and Delbecq dance gracefully around each other while Cleaver avoids steering the mobile into anything, letting its pieces clang softly in the breeze. This is followed by a rolling groove-based track called “Holy Trinity,” which sets the album back on the main road again with quiet force. Among the many highlights: Delbecq plays a clavinet that sounds like a muted marimba or a thumb piano on “Saints,” which is followed by a track called “Sinners,” on which Hebert and Cleaver join in with Delbecq to thank Africa for talking to them. The band tackles “Just A Closer Walk With Thee” with a purity of heart that will put a big dumb smile on your face. Then there's “On The Half Shell,” on which Delbecq combines piano and electric keys, playing the melody line an octave apart on each. Hebert is jumping all over the neck of the bass as well, full of giant octave leaps. Cleaver is again the playful driver of this bus, threatening to run them off the road at every turn just for fun, but in complete control of every situation. I honestly love every second of this recording. There is mystery, beauty, soulfulness and darkness throughout; and the rapport between the players is beyond exceptional – but what absolutely kills me is the glowing tube-amp, wood fire, Christmas lights, cherry-pie-right-out-of-the-oven warmth of every single track. Maybe it's this sub-zero Midwestern nightmare of a winter talking, but I think I'm going to spend every dark evening driving home from work to this album for the next month or so. I cannot find this CD listed on the label's website.